Sleep deprivation in adults and it’s eﬀects is a widely studied topic. Adults can usually recognise the eﬀects of sleep deprivation in themselves and typically know when it’s time to take a step back and lie in. 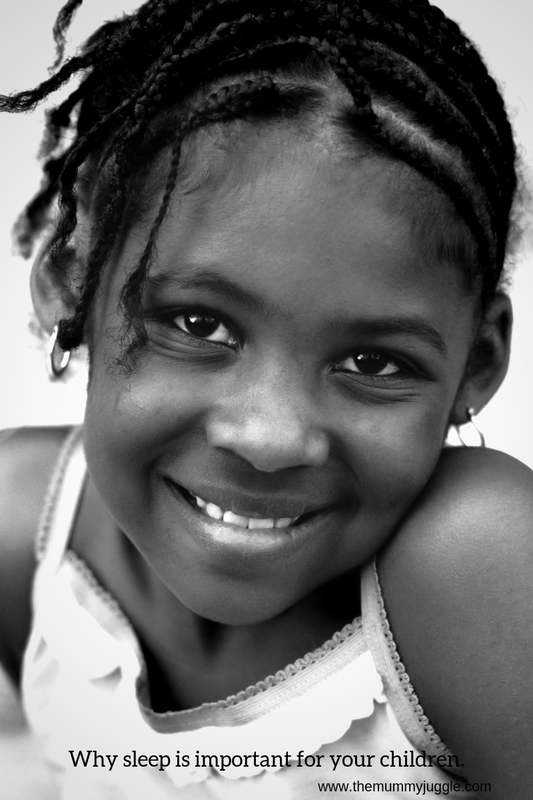 The eﬀects of sleep deprivation on children on the other hand, is not very widely studied. There is a general feeling that children will show you when they are tired and will always get the sleep they need. Generally most people agree on bedtimes for children between 8 and 9 pm, but wake up times are typically driven by our work or school schedules. Many of us would have had the experience of talking with a friend at 10:30 pm and heard children screaming in the background or perhaps it is your own children who jump all around until they fall into bed at 11 pm? So how much sleep does a child really need and will they show you how much sleep they need? The American Academy of Pediatrics recommends the following average amount of sleep for children. I can hear some people thinking, “my child is diﬀerent, he/she does not need so much sleep”. I urge you to read further with an open mind. While I am not a sleep professional, I started to study this topic in 2009. My daughter was around 6 months old and she had grown out of the infant phase and that child would just not go to sleep. As she grew older, it only got worse. In fact, she usually seemed even more awake at 8pm than at 8am. She would seem so super active and super awake and I tended to fall asleep while reading to her. She would wake me up, I would sing, massage etc all to no avail and then she would all of a sudden fall deeply asleep, leaving me exhausted and frustrated. That was when I started to read books about sleep and learn about how important it is and what impact it has on a child’s development and temperament. There is a lot of research that shows that children who regularly get suﬃcient sleep have improved attention, behavior, learning, memory, and overall mental and physical health. 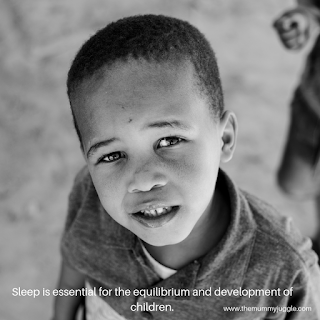 Sleep contributes to proper physical and mental development and wellbeing of your kids. Sleep deprivation on the other hand has a number of negative eﬀects. can also lead to high blood pressure, obesity and even depression. be cumulative, especially for children. Studies show that up to 20% of the children who have been diagnosed with ADHD actually have a sleep disorder. According to a sleep researcher, an estimated 69% of American children are not getting enough sleep. Looking at the schedules in many Nigerian cities, especially Lagos, I am tempted to think the stats are even worse, although I don’t have any research to back this up. For me, the ﬁrst positive effect of understanding the eﬀect of sleep deprivation was that it helped me be more patient. When you know your child is misbehaving, not because they want to disgrace you or because you are a bad parent, but because they are tired, you can deal with their behaviour in a more constructive manner. Rather than shouting or beating them, you should be doing the opposite. When you are calm and ﬁrm and provide sensitive responses to your child’s sleep related misbehaviour, you can help them calm down and actually relax and sleep. Apart from a busy life schedule, tension can also prevent children from being able to go to sleep and sleep well. Tension can be triggered distress or excitement. Common triggers for distress include parental stress, separations, upsetting events, major life changes (e.g. starting school) and ironically, lack of sleep. Common triggers for excitement include overstimulation ( too much input - iPad, tv etc), over scheduling ( too many activities in a day), anticipation, competition/pressure to perform and growth spurts. Since some of these triggers cannot be avoided, if you become familiar with the things that distress or excite your child, you can take steps to help your child relax. As a result, the intensity of the emotions will not overwhelm him and he’ll be ready at bedtime for sleep. 1. Start the day slowly with a calm breakfast. Avoid blaring TV or radio at breakfast so your family can start the day peacefully. 3. Slow down the pace of your day - if the kids are over scheduled, reduce one activity. Try to avoid major exciting events in the evenings or close to bedtime. If you have to take your child to a party at night, keep in mind that they will be sleep deprived the next day except if they get a chance to sleep longer and have a calmer day, so keep in mind you will need to bemore patient with them the next day. 4. Create special downtime’s during the day - time without TV or iPads when the kids craft or read novels or play with Lego. In our household, TV is completely banned during the week. 5. If possible, make the room a nest, serene and solely for sleeping and not jumping up and down on the bed. 6. Hold, touch and hug your child often. Touch has a healing and calming eﬀect, even on adults but it’s vital for children. I encourage you to try and identify the patterns in your child. Discovering their unique pattern is like solving a challenging puzzle and you’ll be delighted by the success have. It’s also good to keep in mind that each child is diﬀerent. Unlike my daughter, my son found it easier to go to sleep and was more in tune with his sleep needs from the beginning. I remember he would ask to be put to bed like clockwork at 7:30pm each day and would be asleep within 5 minutes of his head hitting the bed. While he now goes to bed at between 8pm & 8:30pm, he still rarely has diﬃculty falling asleep. The fact that by the time he was born, I knew a lot more about the eﬀects of sleep and how to help children get the sleep they need has obviously also helped. My son needs more sleep than his sister and cannot handle a sleep deﬁcit as well as his sister can. So my approach to the sleep needs of both kids is individual. I teach them to be self aware of their needs with respect to sleep and how sleep deﬁciency aﬀects them and I encourage you to talk about it with your kids. I wish you good luck on your own journey of better sleep for your kids. Please let me know if this information was helpful.